That bit of information was appalling to me as I attended a parenting class hosted by McKay-Dee Hospital in preparation for my first child. (The answer, folks, is 8–10 diapers a day.) Can you imagine welcoming a baby into your life without a crib, a car seat, clothing, diapers, shampoo, towels, wipes, etc.? You almost need an entire aisle from Walmart to prepare for this newborn! During my time on maternity leave, money was tight. My baby grew so fast that she went from newborn diapers to size three in two months! The tricky thing about a baby is you don’t know how fast they will grow. I was so thankful for the gift of diapers I received from Welcome Baby, especially because they were a bigger size, so that when she grew, I already had a small supply of the next size ready for me. 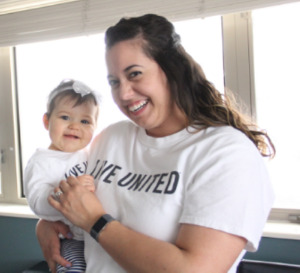 Thanks to generous donations from people and corporations hosting Community Baby Showers, United Way of Northern Utah’s Welcome Baby program can help provide these much-needed items for newborns and young children here in our neighborhood. Even more important than material donations, each family participating in Welcome Baby receives parental support and education. In addition to monthly information tailored to their child’s age, volunteers share helpful mommy tips and experience. What can you do to help your baby sleep through the night? What can you do to help your fussy baby relax? All these questions and more are answered by well-informed and personally experienced home visitors who develop close relationships with these moms and babies. The best part about the information is the timing: helpful information at just the right time in the baby’s development. Welcome Baby home visitors also know what resources are out there that every new mom should know about: HelpMeGrow, BrightByText, Text4Baby, WIC, and other family resources right in their community. The list goes on and on! Thank you Welcome Baby for helping me start my parenting journey on the right foot!